Q: What makes the water-fed rod better than other established washingprocedures? A: Unlike the standard ladder & squeegee method, the water-fed pole allows the experts to reach panes from the safety of the ground. The retractable rod is 22 metres long and can easily reach even smudges on the fourth floor of your premises. Q: What other cleaning possibilities are are part of window cleaning Bayswater? A: Besides providing meticulous exterior window cleaning, the certified technicians can also climb and wash any commercial high-rise property – a service called rope access window cleaning. Finally, the cleaning pros can also take care of stains found on the interior side of your panes, and will employ ladders and sponges to access hard to reach corners. Q: Why are there still water drops on my glass surfaces even after you've scrubbed off all spatters? A: Our water has been distilled from all naturally contained hard minerals. As a result, it will efficiently eliminate all blemishes on its path and will vaporise under the sun without leaving dregs of its own. A: Yes, the Bayswater window cleaners will come with the latest cleaning gear to rinse commercial buildings both small-scale and elevated. The pros can also perform optional cleaning tasks, for instance patio washing and gutter cleaning. A: Absolutely. The team's water-fed rod is linked to a special filtered water container inside the washing vehicle. In case the liquid has been used up, the specialists will kindly ask you to offer them with any internal or outside water source. A: Yes, all our services are thoroughly insured for your comfort. However, our washing technique is among the safest that you can find on the market and we'll make sure to polish your casements without leaving a single graze mark! When you schedule a window cleaning Bayswater session, you'll be able to rejuvenate the casements of any property at affordable rates that remain unaffected by minimum contracts or concealed payments. See if you agree with our point of view – check our user-friendly price table below. Regardless of where your streaks have taken shelter, our efficient window cleaning in Bayswater will repel them with ease. We have covered various washing methods. 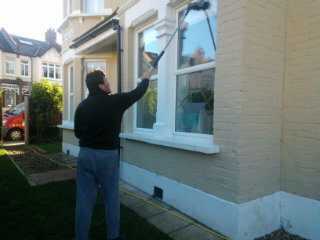 Our outside window polish is designed for properties that do not exceed four floors. To let the daylight back inside, the window cleaners in Bayswater will come in a caravan, outfitted with an extendible water-fed pole. This gear is connected to a water tank, filled with purified water. After being released as a powerful flow from the pole's brush-head modification, the fluid will dissolve all dust build-up in an attempt to renew its previous structure. To reach muddy window corners of multistorey structures, we'll send an established team for rope access window cleaning. These licensed abseilers will utilize well-maintained ropes and harnesses or position ladders and cherry pickers to renew the appeal of your panes. We've got all important COSHH reports in place and follow each and every safety rule and regulation. To make the inside surface of your window façade just as shiny, the technicians will utilize the ordinary ladder and squeegee washing method. Over time, we've responded to the cleaning calls of customers from many nearby regions. As a direct result, we expanded window cleaning Bayswater's horizon and you can now witness our cleaning vehicles in the locations below. For those of you who'd rather book window cleaning services Bayswater W2 online, fill in our get a free instant quote form.